We've entered the age of the $1,000 smartphone. Even if you pay it off in monthly installments, that's a pricey investment. But with some patience, you can pick up used phones at a nice discount. Being patient usually means waiting about a year after a phone is released to grab it. Refurbished phones have been repaired so they can be sold again, so you won't find refurbished versions until a phone has been on the market for a while. And when you do find refurbs, they may not be available in every model, color or configuration. As you can see, refurbished products can be a fantastic deal — but you have to shop with care. The term "refurbished" can mean different things at different retailers. You could get a product that looks brand-new or one that's scuffed up, even if it's been certified to work as well as a new phone. Before you buy refurbished, it's important to read the fine print so you understand exactly what you're getting. Here's what you need to know before you buy a used phone. Refurbished smartphones can have a lot of different origins. The one you find might be something a consumer has returned to the store. It might be a product sent back to the manufacturer because it was malfunctioning. It might be used. But no matter where the phone came from, it's been tested and repaired to ensure that it's as good as new. However, it may not come in its original box or include all of the original accessories — and it could show signs of cosmetic damage. The condition of a refurbished smartphone depends on who refurbished it (and how much refurbishing they actually did). The highest quality refurbished products are factory refurbished, meaning they've been worked on by the original manufacturer. Going back to our iPhone example, if you buy a refurbished iPhone from Apple, in addition to any repair required to ensure the phone is in working order, it will also come with a new battery, a new (and unscuffed) outer shell, all accessories, and a one-year warranty. 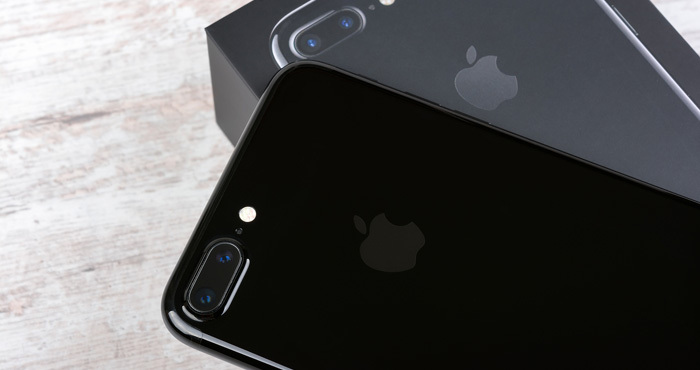 While a phone refurbished by Apple is pricier than other options, it's guaranteed to be as good as new. If you'd rather have a Samsung phone, the company also sells refurbished models. Samsung doesn't promise that the battery or shell will be new, but the phones have been tested and repaired to perform just like new — and a one-year warranty ensures that you won't have any trouble. When you start buying refurbished products that don't come from the manufacturer, things are a bit more questionable. The phone may have been refurbished by the manufacturer or a third party, and you won't necessarily know to what standard. What's the difference between refurbished and certified pre-owned? Any refurbished or certified phone is considered pre-owned. Whether it was returned to the retailer within the allowed period or has actually been used, the retailer can no longer sell it as new. Thus, it's become a pre-owned phone. While refurbished means a phone has been tested and repaired, a phone that's certified has usually only been tested and proven to work properly. Just like a refurbished phone, these can come from just about anywhere. They may have been returned in pristine condition without being used, or they may show signs of wear and tear. Samsung, for example, calls its refurbished phones "certified pre-owned." Because everyone uses these terms differently, it's important to read the fine print before you buy any kind of refurbished phone so you know how they've been refurbished. If you're buying pre-owned, be sure it's either refurbished or certified so you know it's in working order. Otherwise, you may just be buying a used phone with no guarantee that it works. Is it a good idea to buy an older phone? When you buy an older phone, there are some potential concerns. The lithium-ion batteries that power every smartphone degrade over time, holding less and less power. After about two years of standard use, a battery probably only holds 80% of its original charge. For a phone around a year old, that's probably not a huge concern — but if it's two or three years old, you'll want to be sure the battery has been replaced or that it's affordable to replace it yourself. For the best balance between price and performance, we recommend looking at refurbished models that are around a year old. These phones are still new enough that you aren't likely to have issues, but after a year you should find them at deep discounts. By the time they're three years old, the battery will have degraded due to use (unless it's been replaced) and, after another year or two, may not be capable of being upgraded to the latest version of Android or iOS. When shopping refurbished, look for a good return policy and warranty that will ensure that you're buying a product in good working order. Always double-check to find out if the phone is being been sold "as is" or with a short warranty. Large retailers will have return policies so you can take the phone back if you run into trouble. Usually, you'll be able to return your item within two weeks of purchase. Warranties will protect you once your phone's beyond the return period. Look for warranties of at least 30 days, though you’ll find them with coverage of up to a year if you buy from the manufacturer. And that warranty could cover battery performance, too, so you'll have a fix available if the phone's aging battery isn't up to snuff. Some credit card companies will extend the warranty on items bought with their cards, including American Express and Visa Signature. So be sure to check your card’s benefits. When you buy a new smartphone, you expect it to show up in a new box, with a charging cable, headphones and other accessories. But if you buy a refurbished model, you may not get all the accessories. A refurbished phone will usually include a charger, but other accessories are rare. Read the fine print on the product description so you know exactly what you're getting before you buy. Can you use the phone on your carrier? When you buy a phone from your carrier, it's typically locked to that carrier. A refurbished phone may or may not be locked, but it should be clearly noted when you buy. Apple, for example, lets you pick your carrier (or get an unlocked phone), while other retailers may only have stock for certain carriers. If you buy a refurbished phone through your carrier, it will most likely be locked. In short, be sure you're buying a phone that will work with your carrier. The best refurbished smartphones will come from the manufacturer, which will always ensure that the phone is up to factory standards. Though these are also the most expensive refurbished phones, they're still a value compared to buying new — and you'll get the best warranty coverage for them. But if you'd like to save more cash, a trusted third-party retailer is the way to go. Avoid retailers you've never heard of: Buying a refurbished phone is an exercise, to an extent, in trust. You want to be sure it's been properly repaired and that you have somewhere to go if it doesn't work. You're likely to see better deals at other retailers (and eBay tends to have a selection of cheap refurbished phones), but you don't necessarily know what you're going to get. You probably have a local Best Buy that you can visit to ask questions and see what their Pre-Owned and Refurbished stock looks like. Best Buy locations can also be a good place to go for technical support if you have problems. The company has a 14-day return policy and most refurbished phones come with a 90-day warranty. 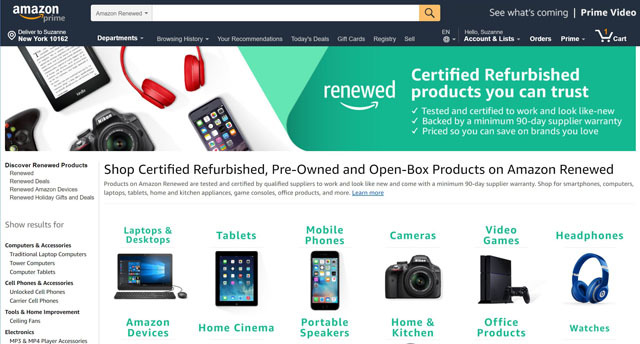 Yes, Amazon has a marketplace of refurbished products, too. Everything is repaired and cleaned, and products are guaranteed to have no visual imperfections that are visible from a foot away — so while they may be scuffed up, they won't be badly scuffed. Most products include all accessories, though if anything's missing it will be noted on the product page. Items can be returned within 30 days and come with a 90-day warranty. We've talked about Gazelle as a good place to sell your old smartphone, but it's also a good place to buy a certified pre-owned phone. The company tends to have a wide range of phones in stock — including the iPhone X — and you can choose the level of quality you're willing to accept. Phones in "excellent" condition will have few (if any) scuffs and scratches, ensuring you get a like-new product. But if you're ok with cosmetic damage, you'll get a better deal on phones in "good" or "fair" condition. There's a 30-day return policy, but no warranty. 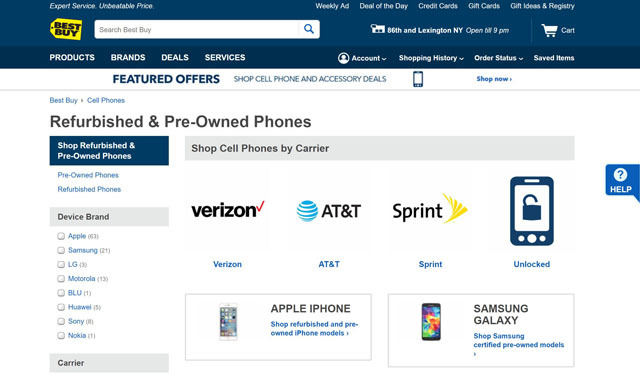 Every carrier will stock refurbished phones, though return policies and warranties vary from carrier to carrier. This can be a good option, if they carry the phone your want, because you can usually visit the store if you have problems with your phone. 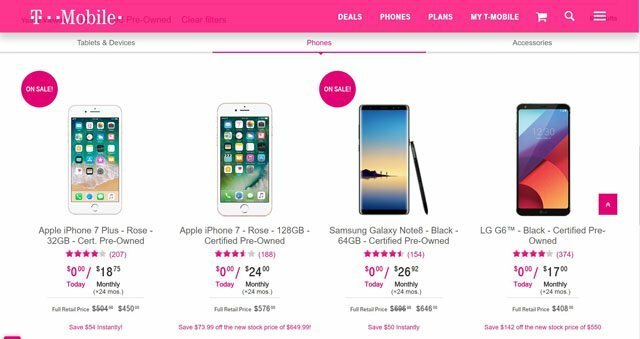 Check out the used phone options at T-Mobile, Sprint, Verizon and AT&T. As long as you're a careful shopper, you can save a lot by buying refurbished. So if you're in the market for a new smartphone, definitely consider a like-new refurbished/certified pre-owned model instead. I am buying from an individual. You say nothing about what to do in that situation.